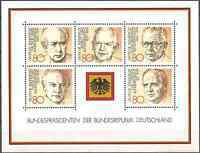 MH 1982 West GERMANY Presidents of FEDERAL REPUBLIC Minisheet 5 Stamps 80 Pfg. West Germany #9 - Nice Lot of all different used Stamps primarily 1976-1977! West Germany - Historic Sites: Nice Lot of all different used Stamps 1987-2004!